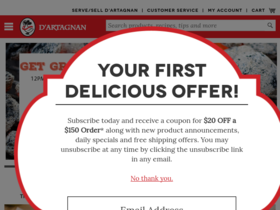 Sign up today for a $20 discount coupon from D'Artagnan.com. Shop sale at D'Artagnan for up to 60% off special offers. Buy More, Save More at D'Artagnan! Save $10 off $75, $20 off $150, $50 off $250+ when you shop today. Check out D'Artagnan online for their latest special offers.